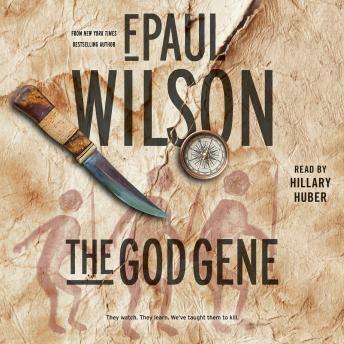 Rick Hayden and Laura Fanning of Panacea return to encounter another mindbending scientific scenario in, The God Gene, a new thriller audiobook by F. Paul Wilson. A million or so years ago, a gene designated hsa-mir-3998 appeared as if by magic from the junk DNA of the hominids who eventually evolved into Homo sapiens. It became a key player in brain development-specifically creativity-and laymen started calling it 'the God Gene.' Keith had been tracking this gene through the evolutionary tree, and was excited by an odd blue-eyed primate he brought back from East Africa. But immediately after running the creature's genetic code, he destroyed all the results and vanished. Rick and Laura's search takes them to an uncharted island in the Mozambique Channel, home of the dapis-blue-eyed primates whose DNA hides a world-shattering secret. In a globe-spanning mixture of science, mystery and adventure, The God Gene takes listeners to the edge of evolutionary theory and beyond...way beyond.